Our mini sessions are a one day event, occurring only once or twice a year. Our mini sessions are shorter (typically 20-30 minutes) compared to our custom sessions, which can last anywhere from 2-3 hours. For our custom sessions, we host the consultation, portrait session, and sales appointment all in your home, allowing us to really tailor the look of the photo shoot to match your home style and decor. If you feel your pet doesn't do well in new spaces and tends to be most themselves at home, a custom session would yield better results, as we can take the time to bring out the best in them in a space they feel truly comfortable. Our mini sessions are hosted in one location, so it is recommended that your pet be comfortable leaving the house and well behaved in public spaces. We offer personalized background and styling choices through our custom sessions, but there is only one background option available for the mini session event, as we are photographing around a dozen animals over the course of the day. We offer some exclusive, smaller products only during our mini session events. Our product line is limited however, compared to our offering for custom sessions. A portion of all mini session fees are donated to a local pet charity. Our Custom sessions come with an in person sales appointment, where we help you decide what products will look great in your home (stress-free ordering!). In November, we partnered with the Dumb Friends League and hosted our event at the inspiring venue, Massif Studios in Denver. Daisy was one of our fav pups that we photographed that day. 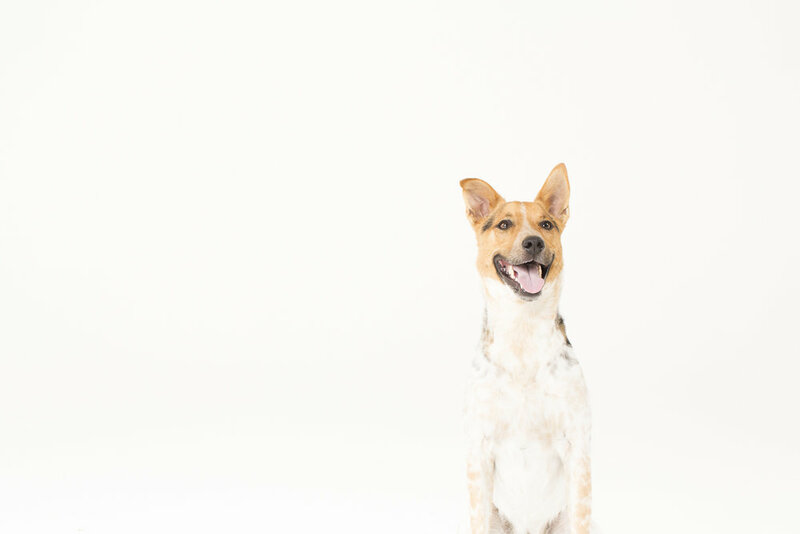 At 3 years old, this cattle dog, Jack Russel, and German Shepard mix had plenty of energy to go around! Daisy's favorite thing to do is play with a ball. She is OBSESSED with tennis balls, and so it was very easy to get her attention when I wanted it. Can anybody say "ball"? "We adopted Daisy when she was a puppy from “Every Creature Counts” in Fort Lupton. She’s always been a very sweet, loving dog with a lot of energy! She loves the outdoors and going on hikes. Her very favorite thing in the world is playing ball. She’d play ball all day, every day if we let her. Lately, Daisy has been spending a lot of time with her “grandmother” who is battling cancer. Daisy really brightens up her days and gives her something fun to think/talk about." For this mini session event, we did a mix of 3 different backgrounds. Once we took to the shag rug setup, Daisy just got cuter. For our last look, we added some dramatic lighting. Check out the spots on Daisy! I love her fur patterns. This little lady is destined for great things. If you'd like to be notified when our next mini session pet event is, head over to my contact page and send me an email! I'll reach out and give you first access to signups, so you can snag up your preference for time!